MM&M has unveiled its annual Agency 100 compilation of the top agencies in medical marketing and communications. 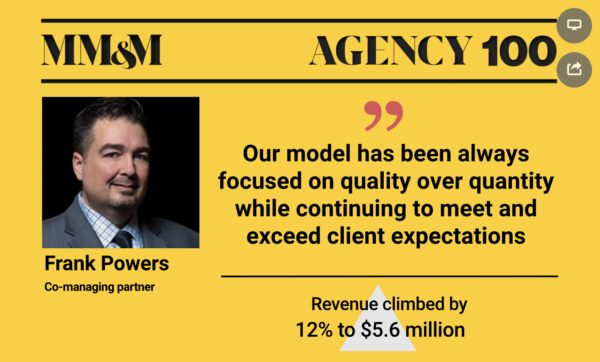 Featuring companies both large and small — 2017 revenue of featured firms range between $1.2 million and $239 million — the Agency 100 is the industry’s defining guide to the agency landscape. The 2018 online and print version of the Agency 100 includes a full profile for Elevate Healthcare, including detailed information about the clients and brands with which they work, as well as past and current revenue, insight from the firm’s leadership team, plans and predictions for 2018-2019, and much more. The Agency 100 package also showcases eight up-and-coming organizations in its Ones to Watch feature; illustrates the lineage between agencies and their parent companies in an interactive Agency Family Tree infographic; features insights from CEOs of the industry’s biggest holding companies; and takes a look at the ways in which agencies have reshaped themselves to stay ahead of a new breed of competitors. To view the entirety of Elevate’s 2018 Agency 100 coverage, click HERE. MM&M is the media brand of record for pharmaceutical marketing and commercialization, delivering the most balanced and relevant coverage of its subject matter. The 50-year-old business title produces an essential mix of online breaking news and analysis combined with monthly print features — timely, objective, original editorial content for an executive audience of leaders and thinkers who work in pharma, medical device, diagnostics and greater healthcare marketing. MM&M also develops annual conferences and live and virtual events, and it runs the industry’s premier awards program, the MM&M Awards, which celebrates creativity and effectiveness in healthcare marketing.